For many companies, user experience design is a luxury. Limited resources and tight budgets often mean software developers design interfaces based on their own preferences and assumptions, without anyone to challenge them. We've all used these systems, and have grimaced when they don't work the way we expect them to. This isn't a dig at programmers. The same thing happens with graphic designers, marketers, project managers, technical writers and others. People of all levels, regardless of title, are making decisions based on experience and instinct – and their bosses expect them to be right, all of the time. I see companies like this every day. A business manager waves a white flag and says, "Our customers aren't doing what we want them to do!" The message makes its way around the office, until someone somewhere suggests that they hire a user experience designer to come in and tell them what to fix. Then someone calls me. My name is Whitney Hess, and I'm a user experience consultant. I help firms make their stuff easier and more pleasurable to use. I really love what I do. I wake up every day thrilled that I get to fight for what people really need, not just what companies want to give them. I believe the work of a user experience designer is about doing good: not just creating innovative, well designed products, but helping people improve their lives. 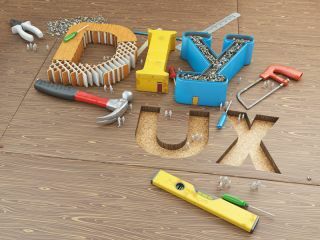 But at the risk of losing some potential clients, I want to let you in on a little secret: you're a user experience designer, too. Every single one of you. Whether it's in your title or your job description, you make decisions in some way or form that fundamentally affect the experience people have with your product. Whether or not you plan it, user experience happens. This article is to help you start doing it on purpose. You have the opportunity to make people truly happy. There are relatively simple activities you can add to your everyday practice to greatly increase your chances of doing so. And your boss doesn't even have to know. I've interviewed dozens of companies on how they "do UX" without a user experience designer on staff, and while the manner in which they do them varies, the techniques fall into three basic categories: design research, web analytics and usability testing. I'll go into each of these in detail, providing advice on how to do them easily and inexpensively, and get powerful results. It all comes down to one thing: listening. To your users, to your coworkers, and to yourself. First we need to ask the question, "What do our users actually need?" Not just what our companies need them to do for us, but what do we need to do for them? Who are our target customers and what is unique about them? What are the problems they're currently facing that we could help relieve, and which problems are the most common? What is the environment in which they're using our product, and how does it affect the way they use it? It may seem daunting to answer these questions when you have an existing user base of 100,000 people, or worse if you have only 100. But you don't have to talk to every single person in order to gain some really valuable insights on the whole. While of course every individual is unique, you'd be surprised by the commonalities you'll find across them – for the most part, we all have the same basic needs, constraints and worries. It's your job to find out what those biggies are. This is meant to be qualitative; you aren't looking for hard numbers here (I'll address that in the next section). Design research is your opportunity to discover and investigate the general qualities of your users in order to better understand who you're designing for. The common methods of conducting this kind of research are all about giving people the opportunity to share themselves with you through user interviews, observations and surveys. There's an academic approach to doing this stuff that's rigid, rigorous and aimed at 100 per cent accuracy. Feedback forms: Enable users to reach out to you from anywhere in the product. Perhaps they've spotted a bug (or what they think is a bug), have a new feature idea, or simply have a question about how something works. Giving them the opportunity to get in touch without having to exit the experience will make the feedback more salient and timely, and will probably also help them describe it better. You can put a simple form on your site that sends submissions to an email address, or you can use a service like Get Satisfaction or UserVoice (although leading your users to a third-party service might reduce the amount of feedback you receive). Log the requests you receive and use them to prioritise upcoming features. Also be sure to track the contact info of those who've requested it so you can keep in touch when the feature is ready to be used and tested. Open-ended surveys: If your product has a trial period or a subscription renewal process, now would be the time to find out what your customers really think of you. A survey doesn't have to be expertly crafted to get great responses from it. The sticklers say that you should only have five or six questions with only one question (usually the last) as an open-ended multi-line text box, but remember that you aren't trying to get statistically significant responses here. You want to hear from people in their own words, so give them the opportunity to do so. Put a link to a survey in a prominent and consistent location, or link to it in a mailing, in order to get as many responses as possible. SurveyMonkey, Wufoo and Kissinsights are some quick ways to get started. Email: Once a user has got in touch via a survey or a feedback form, now is your chance to get to know them better ... by emailing them back. They've told you what, now probe for why. Why is this feature necessary for them? Where have they seen it implemented elsewhere? Why do they use your product in the first place? Ask as many questions as necessary to get at the underlying problem they're facing, and how it's relevant to what your company is trying to solve. Phone: When you come across a user who's particularly vocal or intriguing, ask if they'd mind you scheduling a phone call. You won't have to spend more than 15 or 20 minutes asking them those follow-up questions about their motivations and attitudes in order to gain a wealth of knowledge you wouldn't have otherwise. Most people will be more than happy to help without incentive. Take copious notes or record the conversation if you can (with their explicit permission of course) – this stuff is gold. By capturing just a few good case studies, you'll be able to understand the whole ecosystem in which your product is being used, not just the specific, current flaw in the design that people are complaining about. Iridesco, the maker of the billing and time-tracking web-app Harvest, uses many of these techniques to continuously improve their product – they follow the Japanese philosophy of Kaizen, which focuses upon continuous improvement of processes. "We don't just want to patch," said co-founder Shawn Liu, "we want to address the core problem." This might seem like a lot of new information, but the goal should be to make it as easy as possible on your users, not to make it as easy as possible for you. The fewer obstacles you put in their way to share, the more openly and frequently they will, and the more valuable anecdotes you'll have at your fingertips when the time comes to advocate for the right design decision. For more on design research, see Observing the User Experience by Mike Kuniavsky.